Mischievous 17-year-old gains fan club after being hit by racist senator. Melbourne, Australia – On Mar 16 (Sat), Queensland Senator Fraser Anning had an egg splattered on his head by a 17-year-old teen. The incident occurred during a media conference at a right-wing rally in Moorabbin, a day after the Christchurch massacre in New Zealand. In the video, 17-year-old William Connolly, can be seen subtly standing behind the senator who was speaking in front of a camera. Will was filming on his phone when he pulled out an egg and smashed it on the back of the politician’s head. Senator Anning was seen retaliating at the boy and striking him on the head with his left hand, and hitting him again before surrounding onlookers intervene. The senator’s supporters pin the boy to the floor, with two men holding him while another held his leg up. According to 7 News Sydney, Will has been released pending further inquiries on the egging incident. The video of the incident has gone viral in Australia with “EggBoi” being hailed as a hero. Meanwhile, a petition calling for the removal of Senator Fraser Anning from Parliament was started which has garnered over 1.2 million signatures in three days. Almost 250,000 people signed the petition in the first 18 hours and it has become the largest in Australian online petition history. 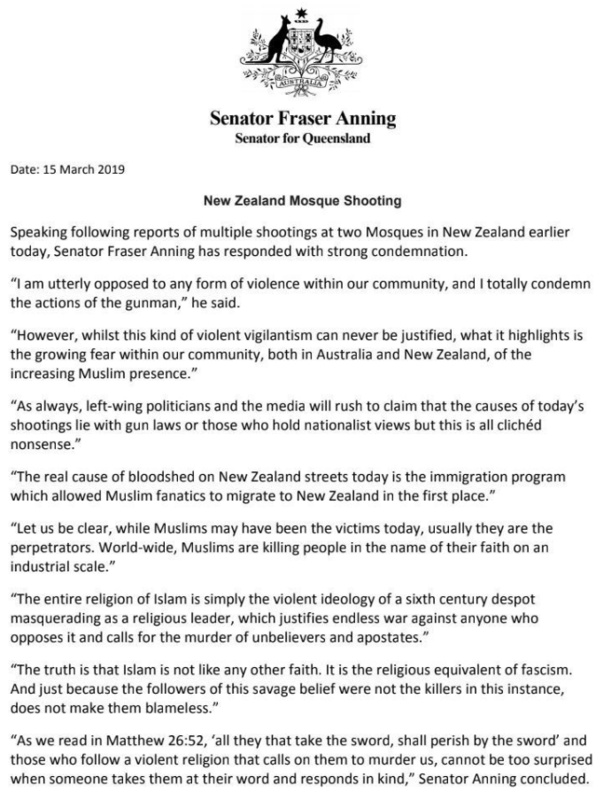 On March 15, just a few hours after the mass shooting, Senator Anning released a statement which consisted of some alarming opinions. “However, whilst this kind of violence vigilantism can never be justified, what it highlights is the growing fear within our community, both in Australia and New Zealand, of the increasing Muslim presence,” he added. “The real cause of bloodshed on New Zealand streets today is the immigration program which allowed Muslim fanatics to migrate to New Zealand in the first place,” said the right-wing politician. He basically placed the blame of the tragic incident on the Muslim community when it was an Australian who did the killing. “These comments are appalling and they are ugly and they have no place in Australia, in the Australian parliament also, and he should be frankly ashamed of himself,” said the Prime Minister who added that the senator should face “the full force of the law” for his actions.